Google announced Allo at Google I/O last year and people were strangely excited about it. Maybe this would finally be the Google chat app to rule them all. When it came out, Allo was lacking in... well, a lot of things. One of the most unsightly gaps in Allo's feature set was the lack of a web version. Google is working on that, and VP of communications products Nick Fox has given us an early glimpse at it. According to Fox, the screen above is from an early version of Allo's web interface. It appears to be running in Chrome on a Mac. The screen has many of the things we've become accustomed to in Allo including smart replies, stickers, and Assistant. 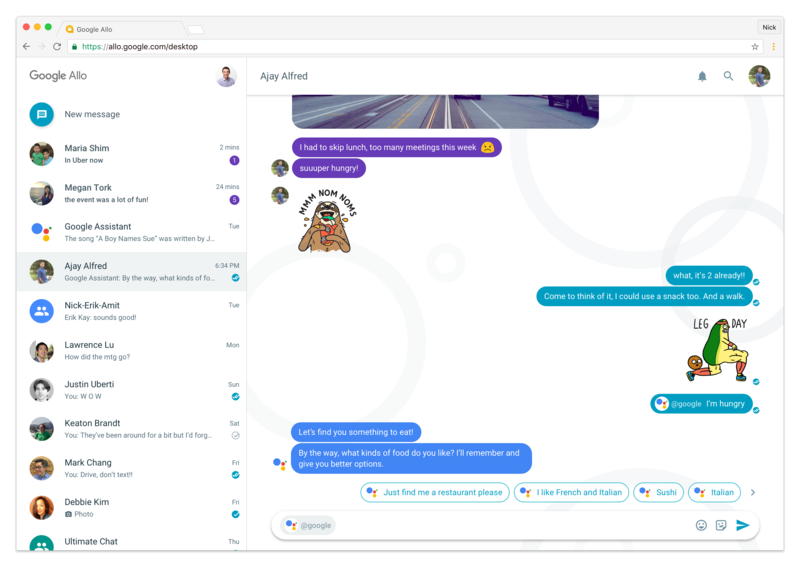 Having Google Assistant accessible on your desktop might be neat even if you don't use Allo for chat very much. This will be a big step for Allo when it's released. The app is currently limited to phones, and only a single phone. If you switch devices, you have to set up Allo all over again and you lose your history. Presumably the web version will always have that backed up regardless of the phone you use. It would be great if Google would allow multiple Android devices alongside the web version, or at least implement backup and restore for chat history. What do you say Google?